As a retailer of musical instruments, we believe that it’s our responsibility to dispel myths surrounding the gear that we sell. And the best place to find the answers is Andertons Labs, your destination for eye-opening tests that are not only informative - but fun too! In this article, we try and find out which bridge is quicker to restring - a Bigsby or a Floyd Rose? There are so many technical aspects involved in the operation of your bog-standard electric guitar. When you think about it, the guitar is a feat of engineering, formed of many pieces and components that must work together harmoniously. But with any complex piece of equipment such as an electric guitar, many myths arise over time about how to setup and operate them properly. And one topic that generates much debate is an essential part of guitar ownership – how to restring! There are many myths surrounding this subject already, one of which we’ve already tackled. Our ‘What’s the best the method for changing guitar strings?‘ article compares the two most popular ways to restring a guitar – all at once, or one-by-one. Whilst that test is relevant, it was conducted on a guitar with a more traditional tremolo system. With electric guitars in particular, there are many variations available when it comes to their hardware, especially bridges. A lot of instruments feature Floyd Rose double-locking tremolos, whilst others also use old-school Bigsby trems. So let’s take closer look at why these bridges warrant their own article, and find out which one of them is quicker to setup in our very own restring challenge! Floyd Rose and Bigsby tremolos may be just two of many different bridge designs available, but they are notorious for a couple of things. The first is obvious; they allow you to add vibrato to notes without physically moving the string with your fretting hand. And the second thing? They’re famously difficult to restring! In this next section, we’re going to break down exactly what these tremolos are. From a little bit of history to who uses them, we’ll also provide some insight into how to restring them too. Whilst both Floyd Rose and Bigsby units typically allow you to lower and raise the pitch of your guitar, the latter is comparatively more subtle. Used frequently by country and blues artists, allowing them to add a gentle warble to chords, a Bigsby is a top-mounted system that sits on the guitar body with a large tailpiece extending to the back. Around since the 50s, Bigsby units are still featured on many vintage-style instruments. They appeal strongly to the purists, for their retro looks, smooth feel and also their sound. Other companies have produced similar tremolos since, inspired by the original design. How do I restring a Bigsby? Restringing a typical Bigsby tremolo can be a fiddly and frustrating experience. But don’t worry, we have you covered! 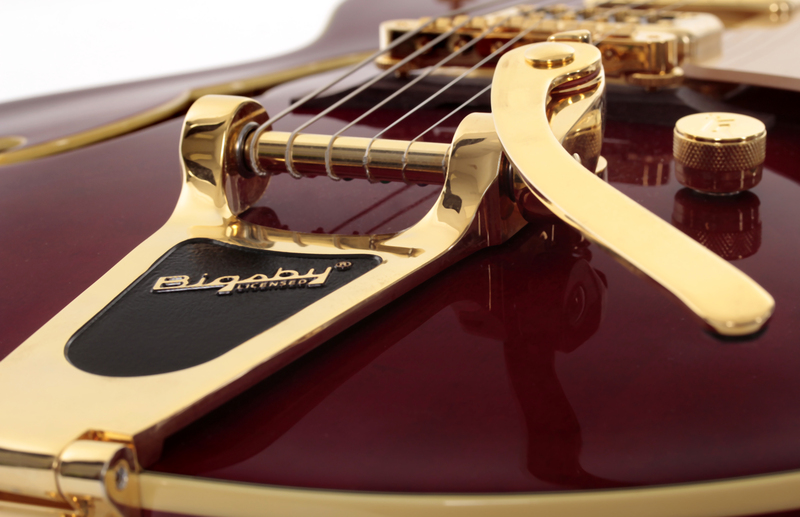 A Bigsby is operated via a moveable metal cylinder, which the strings are wrapped around and attached to. The whammy bar then directly affects how much this cylinder rotates, and thus the affects the pitch of the strings. It’s quite a simple mechanism when you think about it, but restringing a Bigsby isn’t quite as straightforward. This is because each string has to wrap around the metal bar, with the ball end placed through a dedicated ‘axle pin’. This ensures that the string remains in place whilst winding the other end of it around the tuning post. However, the string doesn’t lock into place when threaded though the axle pin, and is susceptible to falling out unless tension is always kept on the string. And if it falls out before the string is fully wound to pitch, you have to start all over again! To prevent this, a foam wedge can be placed beneath the cylinder so that the strings will be kept in place whilst restringing. For a full step-by-step process, check out our ‘Ever Wondered How To Re-string A Bigsby?’ guide! Floyd Rose units, however, are entirely different beasts. This double-locking tremolo system has been around since the late 70s, revolutionising the guitar industry throughout the 80s and beyond. This bridge design was pioneered by players such Eddie Van Halen and Steve Vai, using the system to perform crazy divebomb effects and flutters. 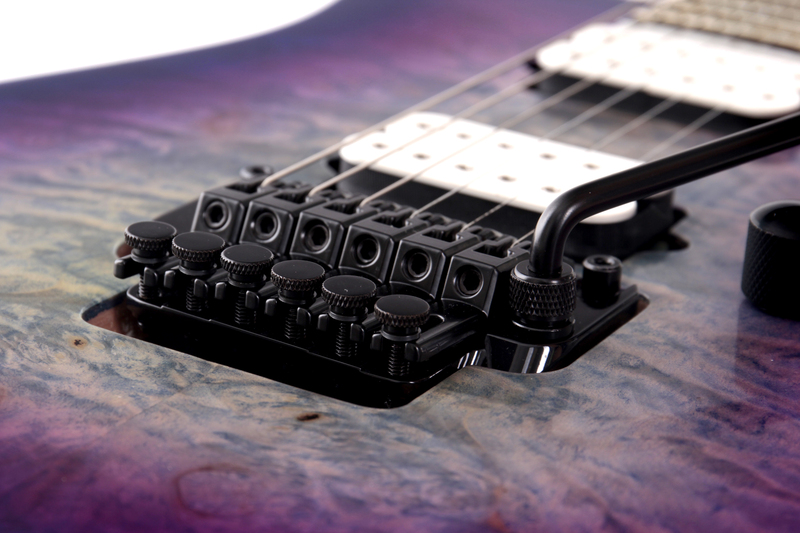 More popular than ever before, the Floyd Rose is featured on countless production model instruments today. As a Floyd Rose locks the strings in place at the bridge and the nut, they are popular not just for the whammy acrobatics that you can perform with them, but also for their tuning stability. Many brands have attempted to copy the Floyd Rose design, including Kahler and also Ibanez. With their Edge series of tremolos, the offerings from Ibanez are almost identical in terms of operation. Acclaimed for their quality, many Ibanez players also appreciate the stability and feel of their tremolos. So for this test, we have used an Ibanez RG with an Edge double-locking trem. As mentioned above, a Floyd Rose allows you to lock the strings at two points on your guitar – at the bridge and the nut. The tremolo features ‘locking saddles’, which the strings are inserted into and clamped into place with via tightening bolts. At the other end of the guitar there’s the ‘locking nut’, where 3 metal pads press down on 2 strings each. These are also tightened with an allen key, and ultimately this prevents the strings from sliding over the nut and going out of tune when using the whammy bar. But how do you tune the guitar if the strings are locked at the nut? Well, the bridge features small ‘fine tuners’, which lets the player adjust their tuning if the strings sharpen or flatten from extensive use. For a full step-by-step process, check out our ‘Learn Everything You Need to Know About the Floyd Rose’ guide! Now that you know more about how to restring these tricky tremolos, let’s see which one is quicker to setup. Although the aim of this investigation is predominantly to distinguish which system is faster and easier to get rocking with, you can also think of it as a general time challenge! Restringing a guitar isn’t exactly the most fun experience, and we wouldn’t be surprised if you’ve been put off by things you’ve heard about Bigsbys and Floyd Roses. So hopefully, this investigation will also prove that it’s not quite as daunting as you may have thought. Based on the methods specified, I believe that a Bigsby will be faster to restring than a Floyd Rose. The extra time required to lock the strings in place both at the bridge and the nut of a Floyd Rose system is the reason for this. Both presenters of the Andertons TV video team, Pete Honore and Joss Allen, are going head-to-head in this challenge. Pete will be responsible for restringing the Bigsby-equipped Gretsch, whilst Joss will undertake setting up the Floyd-equipped Ibanez. The conditions will remain the same for both presenters. Using the main video studio and having access to exactly the same tools, both Pete and Joss will be timed from start to finish. This includes removing the old strings, with both presenters opting for the one-by-one method. Identifying the winner is simple, it will be whoever completes the full restringing process in the shortest amount of time. Overall, I was surprised by how quickly both Pete and Joss restrung their respective tremolos. As predicted, the Bigsby bridge was faster to restring, despite Pete “accidentally using the wrong string” and putting the “A string on the D string because my string fell down”. This therefore proved the common problem associated with Bigsby tremolos, which we identified earlier in the article. The strings are likely to fall out of their pins unless tension is kept at all times, and as Pete was trying to restring the guitar as quickly as possible, it’s not surprising that this mistake was made. It was impressive that Joss was only a few minutes behind, because from personal experience, restringing a Floyd is very time-consuming. This obviously wasn’t the case for him, and shows that you can set up this bridge fairly quickly. Like with most things related to guitar – practice makes perfect!